This week, Jake and I cover the Rancor. Introduced with Jabba's Realm, the Rancor is a high health and damage creature that benefits from many of the brawler and creature cards. Jake and I really love playing the unit and the sculpt. Enjoy! This week, Jake and I are back to discuss the history of Imperial Assault's meta. In this episode, we cover Jabba's Realm to the current state of the game (Heart of the Empire). Thanks for listening! This week, Jake and I take some time to go through the history of Imperial Assault's meta. This is a two part episode, so please enjoy the first half where we discuss the game's launch through Jabba's Realm. This week, Jake and I cover one of our favorite figures, the Bantha Rider. 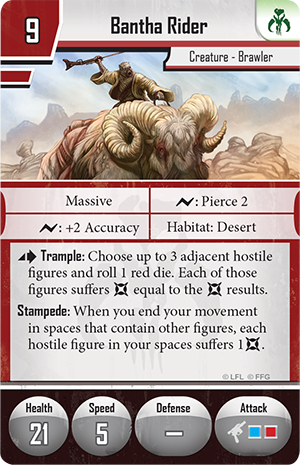 The Bantha has a very unique play style and significantly changes the way your list is played (Jake's words of wisdom: "If you have a Bantha in your list, you're playing a Bantha list") As always, thank you for listening! This week, Jake and I discuss Ko-Tun, one of the new Rebel support units introduced in Heart of the Empire. While we believe she may be a little over priced, we thing she adds a unique and entertaining set of abilities to the Rebel faction. Enjoy! This week, Jake and I invite Matt Lansdowne to discuss the Clawdite Shapeshifter. We go over the Clawdite's various forms, as well as its strengths and weaknesses. While we generally acknowledge that the Clawdite is in a bit of a strange place in the Mercenary faction, I think we were positive on its overall potential and what it adds to the game. Enjoy! PS. Matt is a great guy and we loved having him on. This week, Jake went above and beyond and put together a map review of Mos Eisley Back Alleys. We talk about the different areas of the map and the strategies that we think are most viable - even in the face of a dog getting dropped off at my house. Enjoy!